Leasing Consultant jobs with Venterra Realty offer the opportunity to be a part of an amazing company. 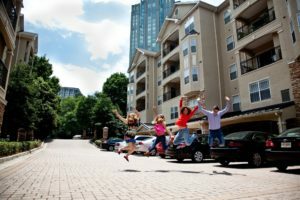 Venterra has Leasing Consultants on staff at properties in Florida, Georgia, North Carolina, Tennessee and Texas. Enjoy a “team-first” culture, competitive pay, 401k matching, and benefits like health, dental and vision insurance, paid vacation and more. If you’re a motivated individual with a passion for sales and customer satisfaction, we encourage you you apply for one of our Leasing Consultant jobs with Venterra Realty today. What Does A Leasing Consultant Do? Our Leasing Consultants are the sales representatives for our communities. On a daily basis they will be in charge of determining the needs of potential residents. They then address those needs with the perfect apartment home and close the sale. In addition, they help ensure that existing residents are satisfied. They aim to provide exceptional experiences and make a lasting impression in whatever they are tasked with. Do you possess a strong desire for excellence? Have strong personal values and want to work for a values-based company? Enjoy working in a fast-paced environment? Have a true passion for helping others? If you answered “yes” to those questions, then we want you on the Venterra Realty team. Do you know someone who fits the bill? Refer them and if they end up working for us, you could earn $250. Why Work At Venterra Realty? Great training and consistent communication are just two of the top reasons to work at Venterra Realty. The company is committed to ensuring that its core values define how business is conducted. Employees across the Venterra portfolio are given the necessary tools to succeed at the company from day one and fulfill our promise to provide a better way of living. The company continually invests in employees, giving them access to the continuing education necessary to excel in their professional careers through Venterra University. There’s a reason employees have named Venterra Realty one of the Best Places To Work in the United States on multiple occasions. Venterra employees are encouraged to give back to their communities as often as possible. The company has donated more than $200,000 to the Susan G. Komen Foundation. Additionally, Venterra partners with VolunteerMatch to pair employees with organizations where they’ll be happy to use their eight company-paid volunteer hours each year. Venterra follows a 7-step hiring process focused on candor and openness when bringing on new team members. After an appealing candidate submits an application online, they have a quick phone call with a representative of the company. This is a great way to get any big questions you might have out of the way before an in-person interview. Only after two in-person interviews are completed with different hiring managers will an offer letter be extended in typical situations. Applicants are asked to complete a hands-on assessment during the hiring process and are given the opportunity to meet the on-site team before taking final steps. This is the Venterra way of making sure new team members fit seamlessly into the culture we’ve created. Are you ready to explore the Leasing Consultant jobs available to you at Venterra Realty? See a list of open positions across the country and submit your resume today!